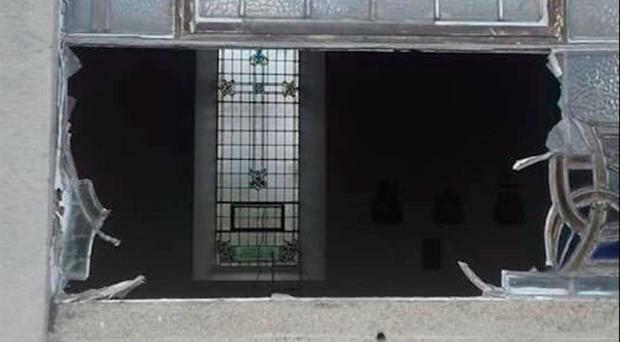 The parish priest of a Co Armagh church said he's been left "shocked and saddened" after a stained glass window was smashed during a break-in over the weekend. The burglary at St Michael's in Newtownhamilton happened between 8.30pm on Friday and 9am on Saturday. "It's very disappointing and the community is sad that such a thing could happen, particularly at a place of worship," said Fr Gerry Tremere, parish priest for Lower Greggan. "I was very shocked myself when I saw it. Two windows were smashed, one a stained glass window. "It's very upsetting and annoying but we will carry on. The bottom half of the stained glass window has been destroyed, but we're hopeful it will not all have to be replaced. We'll be aiming to have things back in order in time to celebrate Easter." Several vacuum cleaners were stolen and drawers strewn across the floor in the break-in. Sinn Fein Councillor Barra O Muiri said it was "an attack on the whole community". "This is extremely upsetting for not only parishioners but everyone," he said and appealed for anyone with information to contact the PSNI. "This is a despicable act. Those engaged in this type of criminal activity need to be apprehended and be brought before the courts. Anyone with information should contact the PSNI immediately". PSNI Constable Tim Coombs has appealed for information. "We would appeal to anyone who witnessed anything suspicious in the area, or anyone who may have seen someone walking near the church carrying tools or the stolen vacuum cleaners to contact police in Newtownhamilton on 101 quoting reference number 306 of 13/04/19. We're also interested in dash cam footage showing vehicles parked in the lay-by close to the church on the Dundalk Road. "Information can also be given to Crimestoppers on 0800 555 111."